This is a stir fry that I used a recipe for! I know you are shocked. I get emails from self.com every now and then (I think I accidentally subscribed once awhile ago), but they don’t spam me too much and sometimes have yummy and healthy recipes. This is one of them. It is labeled as “Beef Bowl with Peanuts” by them which is a little misleading, since it’s a stir fry. It is very, very pepper-heavy. 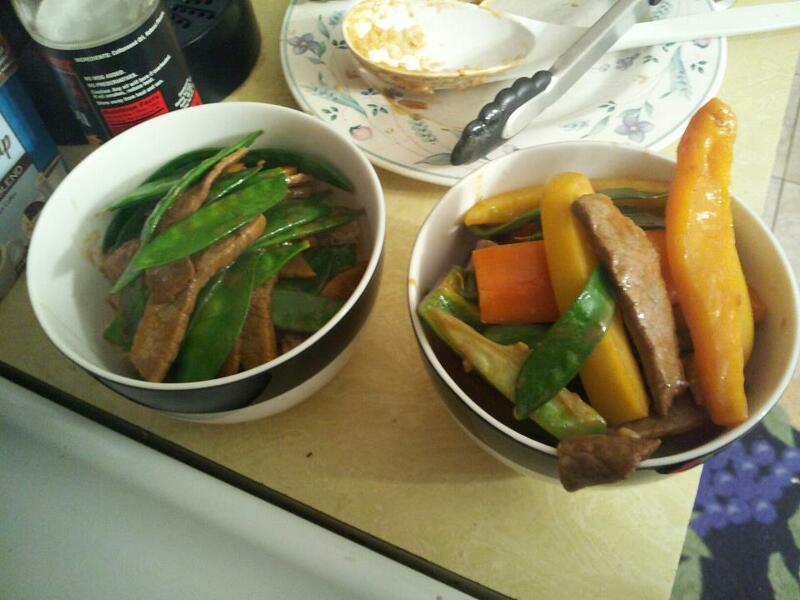 It uses 3 kinds of bell peppers, yellow, orange, and red, which is great, cuz I love peppers and I love colourful stir fries. However, I accidentally got a green bell pepper instead of red (oh well). Also, I added in snow peas, since my husband does not like peppers, and had I *not* added snow peas, he would have been veggie-less. Also, as you can see in the picture below, his bowl contains no peppers. This is because I am a kind enough wife to use tongs in order to make sure he only got snow peas and beef in his bowl. I should add that he was a kind enough husband to choke down an entire bowl even though it was way too spicy for him. Apparently marinating beef with 2 tablespoons of Sriracha sauce is a lot (who knew?). I, however, packed away 2 full bowls. Did I mention I am doing Weight Watchers, but not very well? -The recipe calls to separate everything into bowls at this point, and top with peanuts and cilantro, however I threw the veggies back into the wok and mixed everything together for 1-2mins more, then divided into the bowls.